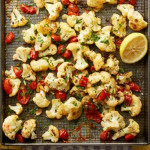 Roasted Italian Cauliflower: Love this recipe, and so delicious!! 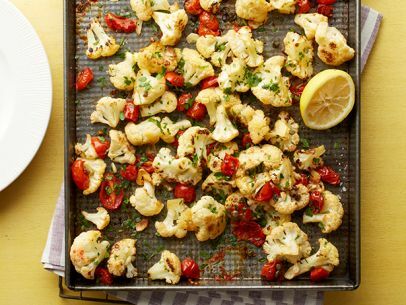 Adjust an oven rack to the top position and preheat the oven to 475 degrees F. Toss together the cauliflower, tomatoes, olive oil, capers, 1/2 teaspoon salt, a few grinds of pepper and the garlic on a baking sheet. Roast until the cauliflower browns in some spots and is tender, tossing about halfway through, about 20 minutes. Toss with a squeeze of lemon and the parsley. Serve warm.